There’s a scary story bouncing around Facebook, accruing hundreds of thousands of likes: the small town of Purdon, Texas, has been quarantined after a family of five was diagnosed with Ebola. The story is a total hoax, put out by a deeply cynical site called the National Report. But to the 340,000 people who saw it pop up in their news feed, it looked real enough to share. "We’ve seen stories on satire sites — fake news sites — getting tremendous traction because they feed on people’s fears," says Craig Silverman, the founder of Emergent.Info. "It’s really becoming an epidemic now." Silverman launched Emergent with Columbia’s Tow Center for Digital Journalism last month to track the spread of rumors online in real time. Many of the stories he’s seen have been organic rumors, things like the pumpkin spice condom or the 50-foot crab that begin life as jokes, get taken out of context, are written up in news stories, and take off on Facebook before anyone bothers to verify them. But he’s finding that a surprising number, especially when it comes to Ebola, are deliberate attempts to deceive. "I've had people emailing me about the Purdon story, very scared, asking if it was true," says Silverman. "It’s really becoming an epidemic now"
It’s proving to be a very successful strategy, particularly for a site called the National Report, which saw its traffic spike to 2 million unique visitors yesterday according to Quantcast. Very few are repeat visitors, meaning they’re just seeing the link on Facebook and clicking. The tendency for bad satire to take off on Facebook is well-documented. I’m not talking about The Onion, which is absurd and funny enough that most people paying attention can’t mistake it for real news, and well-enough known that anyone who does will be quickly mocked. The problem is more with sites like The Daily Currant, whose brand of just-barely-unbelievable stories are political share-bait and have suckered more than a few actual publications into aggregating its stories as news. The Awl’s John Herrman calls it the Borowitz Problem, after The New Yorker humor columnist whose pandering fake news often gets shared far out of proportion — I hope — to the people who actually find it funny. "When you publish a fake headline that sounds almost real, place it on top of satire that's soft enough to skim without really reading, give it a newyorker.com URL, and promote it on Facebook, where basically every headline sounds like satire now, you know what you're really doing," Herrman writes. The new sites like National Report take this phenomenon and push it to its amoral conclusion. If satire mistaken for news can get shared more on Facebook than real news, and you're totally unscrupulous about how you get your clicks, why not drop the satire pretense and just write fake news? "What we’ve seen emerge over the last year is a much more malicious breed," says Silverman, "which are not driven by trying to do comedy or satire, but by what kind of fake stuff can we spin up to get shares that earn us money." "What we’ve seen emerge over the last year is a much more malicious breed"
The National Report appears to have begun as an inept satire site a little over a year ago. Notable past stories include the news that residents of Hanna, Oklahoma, were going to be implanted with RFID chips as part of an Obamacare pilot program, which freaked people out sufficiently to warrant a debunking in the Caspar Star Tribune — "Satirical article creates stir in Wyoming town" — in which the Report’s publisher, Allen Montgomery, mocks anyone dumb enough not to fact-check his stories. That was back when the site called itself satire in a now-deleted disclaimer. More recently, the Report wrote a tremendously popular story claiming that Facebook would begin charging users, replete with fake quotes from Mark Zuckerberg. Earlier this week it posted a story about Banksy getting arrested and identified, repeatedly debunked but still getting tens of thousands of likes. Emergent's chart of the spreading Purdon hoax. 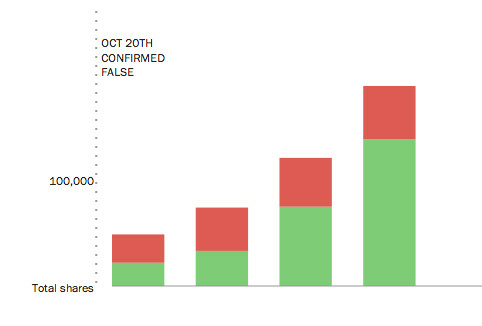 Green represents shares linking to the hoax, red represents shares debunking it. On October 1st, National Report posted a story claiming that an entire Texas town was quarantined after a family tested positive for Ebola. The story exploded on Facebook, accruing hundreds of thousands of likes. The Report has since thrown all its fake resources into the fake story, sending a fake journalist to file fake reports from the ground about fake outbreaks, quarantines, and CDC coverups. On Monday the site claimed that a class of kindergartners had been infected by a Liberian exchange student, a xenophobic detail in keeping with the site’s right-wing tone. Now it’s pushing a story about ISIS Ebola agents in Arizona. 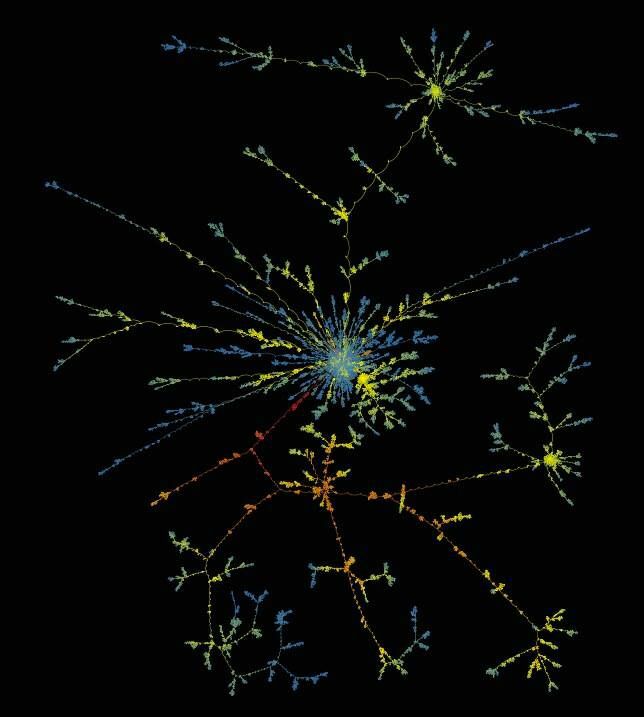 Emergent's data on the spread of the National Report's Banksy hoax. Green represents shares supporting, red represents debunking. Despite being immediately debunked, the hoax eventually won out. Facebook is the major vector for these fake news stories, partly because Facebook drives much of the traffic to news stories generally, but also because certain characteristics make it a powerful platform for disseminating rumors. Sites, no matter their pedigree, look pretty much the same in your news feed — just a headline and a caption — making disreputable sites harder to detect. You’re more likely to trust news coming from someone you know. Readers often reshare without reading, or skim quickly if they do click through. Salacious and alarming stories are more sharable than stories debunking them; Silverman's initial data shows multiple takedowns combined getting just a fraction of the shares as the original rumor. The Banksy hoax was quickly debunked by 12 different sources, and for a while the truth was winning out over the lie, but three days later the fake story has been shared almost three times as often. "Twitter is more where rumors are birthed, but Facebook is where things absolutely catch fire"
The Texas quarantine story was shared almost entirely on Facebook — 0.3 percent of shares came from Twitter — which makes sense considering how quickly it would be debunked on a faster platform populated by more news-savvy users. "Twitter is more where rumors are birthed," says Silverman, "but Facebook is where things absolutely catch fire, in particular when you’re talking about hoaxes and fake news articles." Ebola is the perfect subject for these sites. 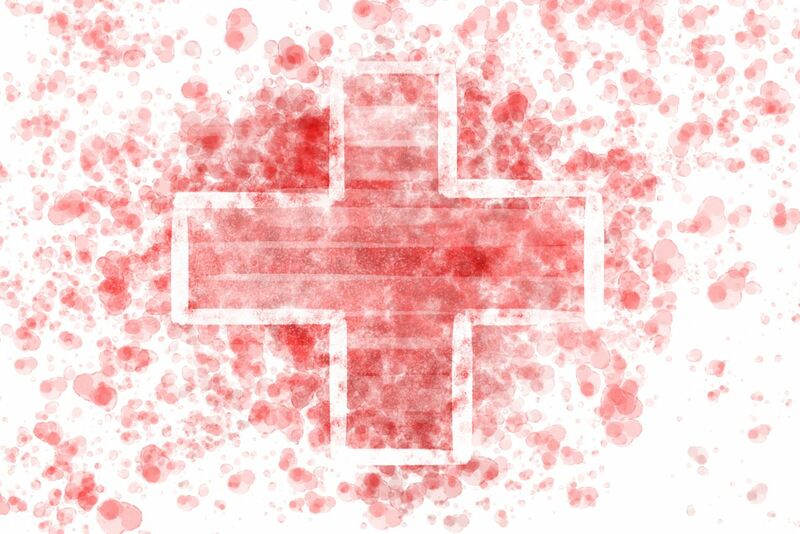 "There’s a lot on Emergent about ISIS and Ebola for the simple reason that it’s human behavior," Silverman says. "When there’s a lot of fear and anxiety and lack of information, or at least lack of understanding, humans try to talk through it, they throw stuff out there, and that births rumors." Aid workers in Africa dealing with the actual Ebola crisis have also had to contend with dangerous rumors — that Ebola itself is a hoax, that it’s a Western plot, that aid workers will kill anyone infected. Here in the States there is less to fear, but plenty of media ready to capitalize on it, whether through deliberately deceptive "satire" sites or irresponsible misinterpretations of science. The idea that Ebola is airborne is proving a particularly persistent rumor as various sites twist statements that such a mutation is not beyond the realm of biological possibility to mean that it’s possible or may have already happened. These rumors would likely be bouncing around anyway. Social media and the incentives it creates, Silverman says, simply work as an accelerant. 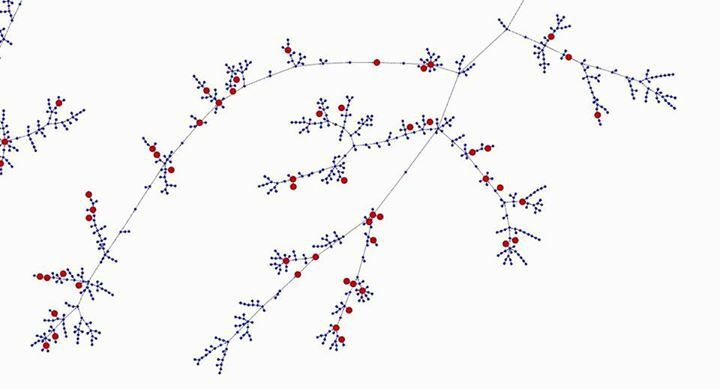 A diagram of a spreading rumor by Facebook data scientists in the paper Rumor Cascades. The rumor was an image of a Cabela's receipt that said customers were paying an extra tax because of Obamacare. Despite persistant Snoping, the rumor continued to spread. Obviously it's in Facebook's interest to keep its newsfeed from filling up with garbage, but it's unclear how it could stop the spread of these hoax stories. Facebook is continuing to test "satire" labels, but only in the related articles that pop up after you click on a story and return to Facebook. (The Onion summed up people’s response well.) It has attempted to algorithmically weed out misleading clickbait headlines by burying stories that people share without reading, or that people click on and immediately return to Facebook, but it’s hard to imagine a similar filter that would work for posts that deliver exactly the story the headlines promise, albeit a fictional one. Debunking fake stories has a limited effect: a Facebook data science study earlier this year found that putting a link to the rumor-debunking site Snopes into fake stories made people four times more likely to delete their link, but the story continued to spread. "This suggests that their high virality can overcome the temporary setback dealt by being Snoped," wrote the researchers. One branch of the rumor cascade. Red dots indicate posts that were Snoped. Maybe the sites will become victims of their own success. The Daily Currant doesn’t seem to get linked to so much anymore, and it seems likely that the National Report’s Ebola spree is on its way to burning itself out. Already you can see the narratives diverging. As the quarantine ends for those in contact with Dunan, the National Report is declaring that Dallas has cancelled Halloween and infected ISIS agents are crossing the border. Hopefully panic will subside to the point that these headlines seem obviously fake to everyone, and attention will go back to the real crisis in Africa. At least until we find something new to panic about. In the meantime, Silverman is busy with Emergent, watching how the rumors spread and get debunked, collecting data for a paper due sometime next year. He’s interested in the dynamics of online rumors generally, but the fake news sites have become an unexpected focus. "I’m actively now thinking about ways to go after these fake news sites," he says. "We need some way to crawl these sites and figure out which stories are starting to get velocity so we can counteract them, ruin their incentive, prevent them from getting the big hits. But I have no idea what the best way might be. There are so many."